The Nobis Products Septic Tank Outlet Filter neatly fits into the Nobis Products Outlet Fitting and is held in place by the push on cap. The filter can be pulled out of the tank through the inspection opening. A 20mm flow restrictor orifice slows the flow out of the tank to ensure optimum deposition of sludge in the tank. This protects absorption trenches and slows the flow into any downstream treatment process. The filter has a large 0.211m² area to resist clogging. As sludge builds up on the filter surface, the weight of the sludge causes it to slough off and fall into the tank. 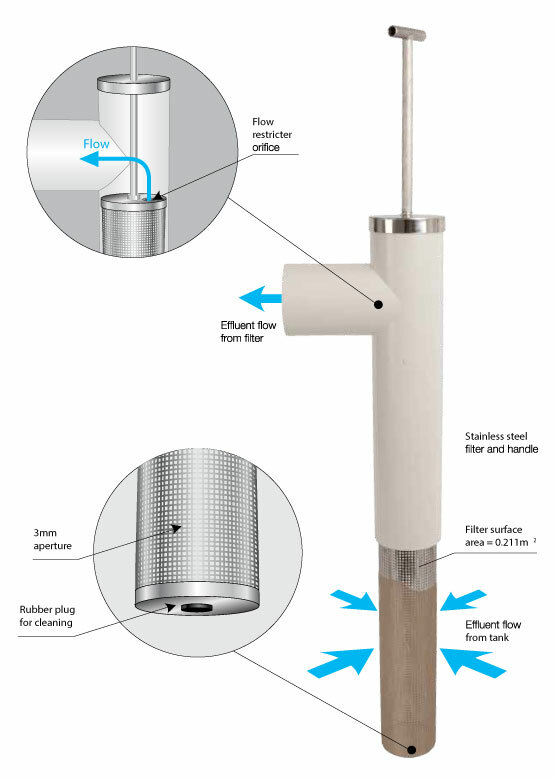 The filter is made of 2mm thick 304 stainless steel and can be cleaned when necessary with a wire brush. 304 stainless steel Robust. Provides long life and makes it easy to clean. Filter area – 0.211m² Large area to trap solids. Extends cleaning periods. Flow restricter orifice – 20mm Slows outlet flow. Improves solids settling in the tank. Stops septic tank hydraulic shock. Cap secures filter in outlet square Prevents over flow of solids into top of outlet if tank level rises. Stops filter floating out of outlet square. Various handle lengths for deeper tanks fitted with risers Standard handle – 450mm. Longer handles are available – 550mm, 850mm, 1150mm.